Bored on a hot afternoon, Alice follows a White Rabbit down a rabbit-hole – without giving a thought about how she might get out. And so she tumbles into Wonderland: where animals answer back, a baby turns into a pig, time stands still at a disorderly tea party, croquet is played with hedgehogs and flamingos, and the Mock Turtle and Gryphon dance the Lobster-Quadrille. In a land in which nothing is as it seems and cakes, potions and mushrooms can make her shrink to ten inches or grow to the size of a house, will Alice be able to find her way home again? Standard mass market paperback reissue with a nice embossed cover. Available for one penny on Amazon. What Would Alice Do? Advice for the Modern Woman. Quotes from Lewis Carroll with a foreward by Lauren Laverne. Lewis Carroll’s masterpiece Alice’s Adventures in Wonderland and its equally famous sequel, Through the Looking-Glass, are among the most quoted works in literature. In What Would Alice Do?, a handy, pocket-sized volume, are the pithiest quotations from the White Rabbit, the Mad Hatter, the Queen of Hearts and, of course, the irrepressible Alice, every one of them pertinent today . . . and guaranteed to put a Cheshire grin on your face! What Would Alice Do? offers advice for any unreasonable, demanding and downright confusing situation, from one of the most iconic female characters in literary history. Forthright, polite, and always true to herself, Alice will help you navigate life as she did Wonderland – just ask yourself, what would Alice do? Sir John Tenniel’s original engravings have defined our image of Alice ever since the story was first published in 1865. Reproduced to the highest quality, the iconic images in this book will delight both fans and those discovering them for the first time. Featuring a foreword by Lauren Laverne, a gorgeous foiled cover and Tenniel’s famous black line illustrations, this beautiful little book of Alice quotes makes a wonderful gift for any fan of Alice in Wonderland. Alice’s Adventures in Wonderland Colouring Book, with original artwork by Tenniel and quotes by Carroll. Published by Macmillan Children’s Books (24 Sept. 2015). Colouring books are all the thing at the moment, and this one coincides with the 150th anniversary of the publication of Alice’s Adventures. The Macmillan Alice Colouring Book is a beautifully produced colouring book, with black line illustrations by Sir John Tenniel, taken from the original Alice’s Adventures in Wonderland andThrough the Looking-Glass, with added decoration and imagery to stimulate the imagination and soothe the mind, as you lose yourself in Wonderland. This gorgeous colouring book, from the original publisher of Lewis Carroll’s beloved masterpiece, features all of Wonderland’s favourite characters, the White Rabbit, the Cheshire Cat, the Mad Hatter, the Red Queen and of course Alice herself – just waiting to be brought to life with colour. 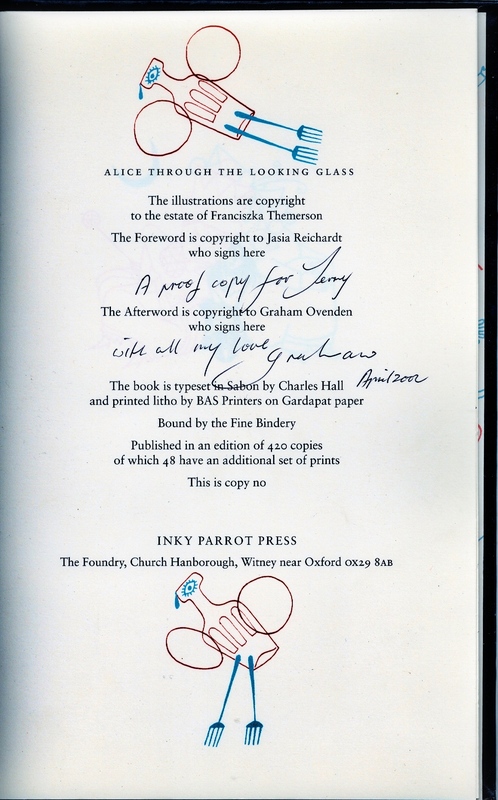 After Lewis Carroll- with text by Jennifer Adams and art by Alison Oliver. The slithy toves and borogoves invite you to take an adventure through the tumtum trees in Jabberwocky: A BabyLit Nonsense Primer. Jennifer Adams cleverly pulls text from Little Master Carroll’s original poem and pairs it with Alison Oliver’s bright and cheery illustrations to create a whimsical tale. Wonderland No More by Kevin L. Anderson, Lansing D. Tryon and Jordan Peacock. Softback, with B&W text & colour cover. Published by Triple Ace Games. In 1865, Lewis Carroll introduced the world to the delightful nonsense of Alice’s Adventures in Wonderland, and followed up with Through the Looking Glass, and What Alice Found There in 1871. These tales present us with a world of whimsy and absurdity, and maybe just the tiniest hint of danger and adventure. Wonderland No More provides a setting for adventures within a realm of fantasy and the unexpected, a madcap ride that bounces between humor and horror. Here, when the Queen of Hearts cries, “Off with their heads!” it usually happens! Take on the roles of wooden Chessmen, two-dimensional Cards, talking Animals, mobile Plants, Tweedle, or even the occasional Human. Knights quest for blessed artifacts of Alice, Little Girls master the deadly Queen’s Croquet, Haberdashers have a few tricks under their caps, and Gourmancers create magical foods and drinks (helpfully labeled “Eat Me” or “Drink Me” for those who can’t figure it out on their own). 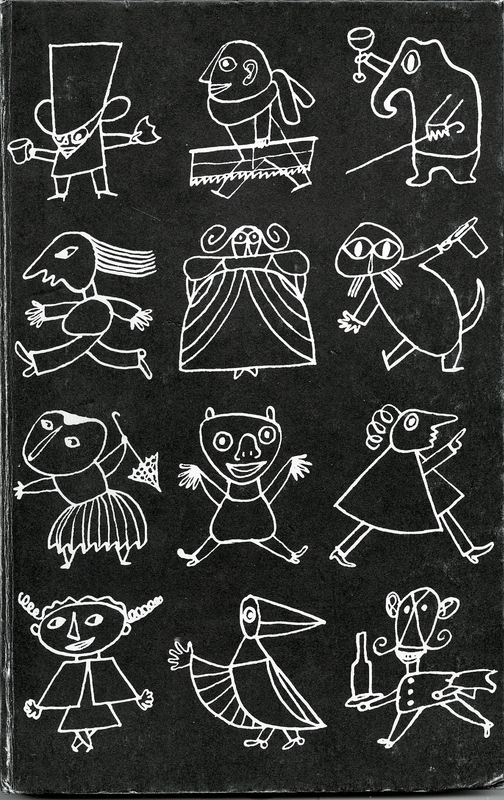 Contained in this book:Six playable races, including Animals, Cards and Chessmen. * Over 40 new Edges and Hindrances explore the new character options the world of Wondrland. * Three Arcane Backrounds – holy priests who worship Alice or the Spirit of Conflict, Gourmancers who cook their powers into dishes and Haberdashers wielders of hat themed magics. * Detailed setting rules covering the science of Wonderland, its relation to our world, and more. * A fully detailed campaign. * Over twenty Savage Tales. * Side Quests and Other Diversions – suggestions for further adventures along various themes. * Full stats for dozens of allies, opponents and creatures the heroes will encounter on their journies. Triple Ace Games presents Wonderland No More for the award winning Savage Worlds RPG – adventure in Alice’s world! money. Tax evaders disappear or become outlaws, and need to be tracked down. Common Folk: “From small acorns mighty oaks grow,” so says an old proverb, and it is nowhere truer than with the common folk of Wonderland. By circumstance or happenstance, many a common villager has been thrust upon the path of adventure. Explorer: These folk are no longer content to stay in their known and safe area, following the urge to wander and see what is over the horizon. Gourmancer: A few of those who study the culinary art of preparing magical dishes choose to travel the realms to sell their recipes to those who have immediate use for them, to cure an ill or right a wrong. These wandering Gourmancers often stumble into adventure whether they seek it out or not. Haberdasher: Sometimes people ask for the strangest things on their hats! Whilst seeking the perfect jubjub feather, other adventures may intervene. Sometimes pops up on Amazon . Mine was a birthday present- Thanks Roz & Simon! 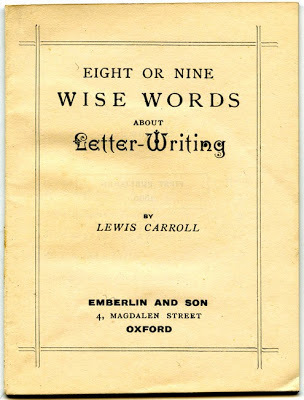 The Wonderland Postage-Stamp Case Along with Eight or Nine Wise Words About Letter-Writing by Lewis Carroll. Modern French facsimile edition of the original, which was published by Emberlin and Son in 1890 and was sold in a printed envelope, together with a pamphlet written by Carroll. Some American writer has said “the snakes in this district may be divided into one species—the venomous.” The same principle applies here. Postage-Stamp-Cases may be divided into one species, the “Wonderland.” Imitations of it will soon appear, no doubt: but they cannot include the two Pictorial Surprises, which are copyright. You don’t see why I call them ‘Surprises’? Well, take the Case in your left-hand, and regard it attentively. You see Alice nursing the Duchess’s Baby? (An entirely new combination, by the way: it doesn’t occur in the book.) Now, with your right thumb and forefinger, lay hold of the little book, and suddenly pull it out. The Baby has turned into a Pig! If that doesn’t surprise you, why, I suppose you wouldn’t be surprised if your own Mother-in-law suddenly turned into a Gyroscope! 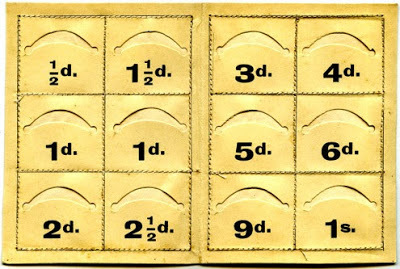 Inside there are sections for different value stamps of the time, with an extra slot for the most commonly used onepenny stamp..